Pantropical spotted dolphin and calf. At birth, these dolphins do not have spots; they develop as they age. The species can be distinguished by the dark coloration (“cape”) on their backs and their slender white-tipped beak. Image credit: NOAA Fisheries. As the name suggests, pantropical spotted dolphins (Stenella attenuata) are found in tropical and subtropical waters worldwide, including deep and shallow regions. Like other members of the genus Stenella, these dolphins are relatively small, reaching lengths of 2 m (6 to 7 feet) and weighing approximately 114 kg (250 pounds). Named for the spots that develop on their bodies as they age (they do not have spots at birth), this species can be distinguished by a slender white-tipped beak and the dark coloration (“cape”) on their backs extending from their head to a point between their dorsal fin and their tail. Pantropical spotted dolphins usually form pods of several hundred to over 1,000 animals. In the eastern tropical Pacific, they often swim with other delphinid species, such as rough-toothed dolphins, short-finned pilot whales, and spinner dolphins. During daylight hours, they reside in areas of shallower water (between 90 and 305 m [300 -1,000 ft]). At night, they move to deeper water areas and make long foraging dives into the scattering layer for cephalopods and fishes. Pantropical spotted dolphins are fast, acrobatic swimmers that frequently leap out of the water. Image credit: NOAA/NMFS/SWFSC. Like other odontocetes, the vocal repertoire of pantropical spotted dolphins includes whistles, clicks, and buzzes. Their whistles are upsweeps ranging in frequency between 10 and 20 kHz with durations of approximately 0.7 to 0.9 seconds. 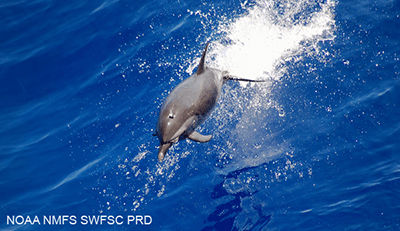 The whistles of the pantropical spotted dolphin are similar but slightly higher in frequency than those of other Stenella species. 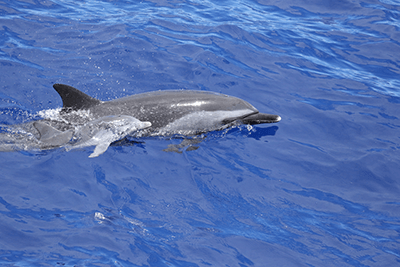 NOAA Fisheries, Pantropical Spotted Dolphin.